Seeker's Bad Science podcast tackles the director’s eye-popping space epic. In 2014, director Christopher Nolan (The Dark Knight, Inception) released the hugely hyped space epic Interstellar. Set on (and off) a near-future Earth, the film imagines a scenario in which ecological degradation has turned the planet into a dying dustbowl that can no longer sustain human life. In an effort to find a new home world for our species, what's left of NASA dispatches a team of astronauts to pilot their ship through a wormhole just past Saturn. After that, things get weird. Nolan's film is certainly ambitious. At nearly three hours running time, it takes viewers on an epic celestial scouting mission featuring interdimensional time warps and planet-spanning tsunamis. But how does the film hold up in regard to the actual science of space travel? 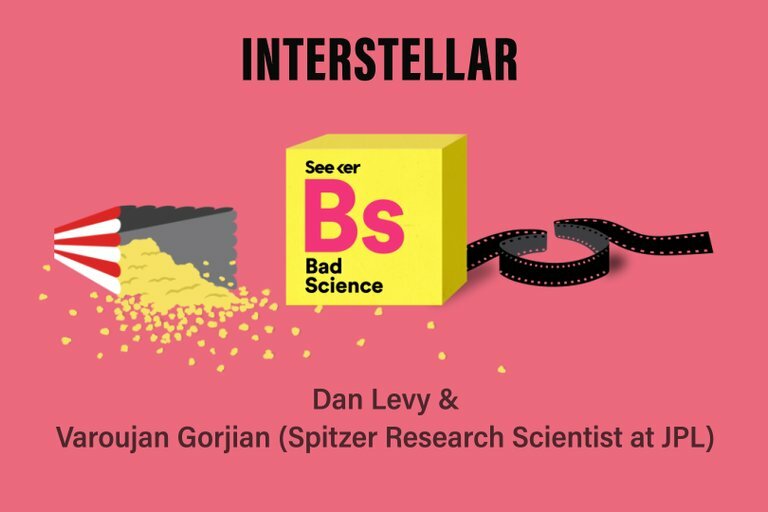 Interstellar gets a thorough cosmic dissection in the latest episode of Bad Science, Seeker's podcast dedicated to exploring the real scientific principles behind popular speculative fiction films. In this week's show, host Ethan Edenburg is joined by comedian Dan Levy and Varoujan Gorjian, research astronomer with NASA's Jet Propulsion Laboratory. While it's generally acknowledged that the film's plot holes are bigger that its wormholes, Interstellar nevertheless takes its hard science seriously. The film covers a lot of territory, and the filmmakers famously collaborated with top researchers and astrophysicists on script details. All of which makes for one of the most delightfully nerdy Bad Science episodes so far. Focusing on the core astrophysics behind the film's premise, guest scientist Gorjian provides a breakdown of the cosmic phenomenon known as the black hole. As Gorjian explains, the escape velocity required to pull away from a black hole is so titanic that it exceeds the speed of light. Understanding the basics on black holes can help viewers appreciate the film's central premise of a wormhole, Gorjian says. In science fiction — and certain arcane branches of theoretical physics — wormholes are cosmic portals that fling matter and energy across vast distance of time and space. Tune in for this week's episode for more details on escape velocity, time dilation, and gravity wells. The knowledge may come in handy soon, too. In the last scenes of Interstellar, Nolan follows his blockbuster instincts and sets us up for a potential sequel. Might we suggest: Interstellar 2: Interstellarer. That thing will write itself!